Thank you for perticipating #578 regular meeting despite Bon vacation. Your contribution helped me a lot to move the meeting forward as first-time Toastmaster of the Day. Especially, I thank TM K from Yokohama Ocean TMC and TM S from Yamato Bilingual TMC for taking their roles. I enjoyed the meeting very much and hope you did likewise. YTMC 574th regular meeting is the last meeting in this term. I was happy to take TMOD at such a special day!! At this meeting, we had Installation Ceremony. New officers were selected in the last meeting. YMTC makes a new start on July. Before that I really want to appreciate current officers. Especially I’d like to say “thank you” to our president TM Nirupam!! He thought of YTMC members first and he chose members who contributed greatly to development of YTMC. He called them “Star of YTMC” and gave some materials like Trophy or pin badge to them. His attempt made many members active to YTMC meeting. Unfortunately, he left Japan on last February, and he couldn’t continue to lead YTMC as the president. But I think that he served as YTMC president!! Next month I am the president of YTMC. It is very big role for me, but I work for our club members, and create splendid club at Yokohama!!! Let’s enjoy New YTMC together!! I have been in Den-en Toshi TMC for 22 years, which was built by one member of Yokohama TMC. Den-en Toshi TMC has the different atmosphere from that of Yokohama TMC, as it’s members are relatively elder, and it’s atmosphere is stable, reliable, and traditional. Yokohama TMC, I joined last year, has been vivid with many of young members, and it is led by young officer team, though the elderly members contribute a lot. I like Yokohama TMC members’ attitude, which are enthusiastic in learning Communications, enthusiastic in learning English abilities. 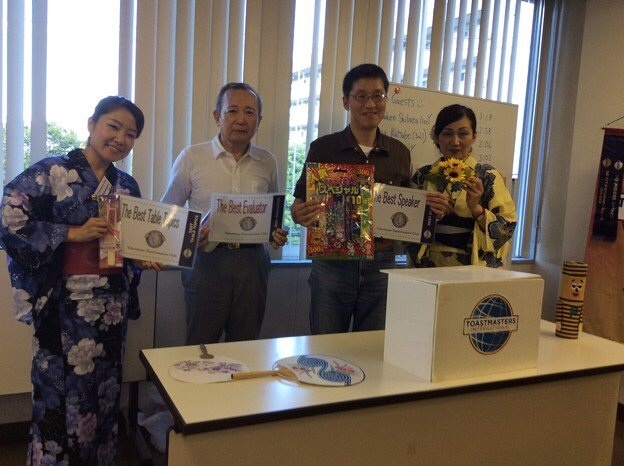 In many of the meeting, always young guests people have attended Yokohama TMC. This shows Yokohama TMC is attractive and friendly club. Let’s learn communications and leadership, positively, in friendly atmosphere! !